Everything you need to understand your business electricity bill. Your electricity bill has been designed so they’re easy to understand, however we understand this can be a little tricky. 1 Account Number – Providing us with this number when you have a query, will help us find your account quicker. 2 Invoice period – The period of time in which you are being billed for. 3 Previous months invoice – Highlighting any adjustments (default fees/ad hoc credits)/payments since your last monthly invoice. 4 Overview of this month’s invoices – Highlighting all additional charges as highlighted in your contract charges and VAT. 5 Total amount – This figure shows how much will be taken from your account (if a minus number is shown, your account is in credit). 6 Date your direct debit will be paid – This is the date your payment will come out of your account. 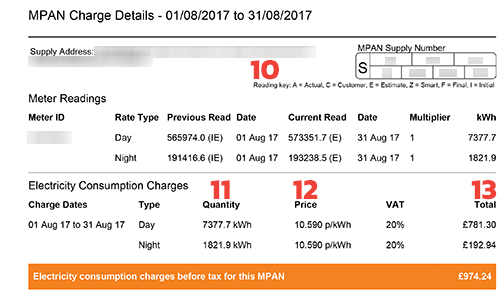 7 MPAN – This is your meter point administration number and can be used to uniquely identify your electricity supply points. 8 Contract end date – This is the point at which your contract will come to an end. Read more about closing your account. Standing charge – The standing charge is the cost you pay to us, in order to access your energy. Climate Change Levy (CCL) – Read more about the Climate Change Levy. DUoS (Distribution Use of System) charges – Read more about DUoS charges. VAT (Value added tax) – Read more about paying VAT. 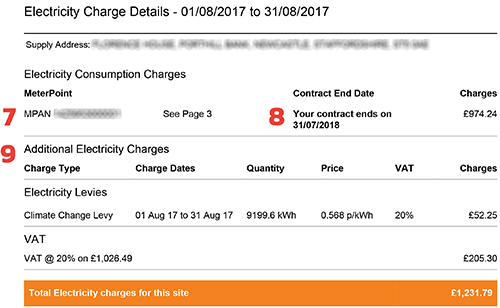 Consumption breakdown – The below highlights how we’ve calculated your energy charges for the invoice period. Key for meter reads – The key shows what we’ve based your consumption on, for example the meter reads. Quantity – This shows your consumption for the period in which you are being charged. Price – This shows the amount you are paying per kWh (pence). 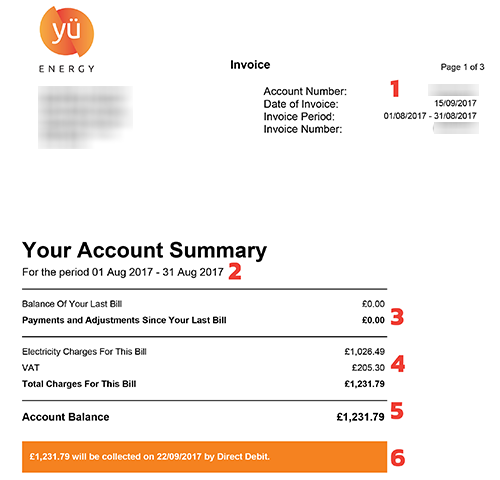 Electricity charge – This is the amount you are paying for your energy before any other charges have been incurred, such as VAT.